The lovely Annie, founder of the just as lovely Singapore based online boutique The Scarletroom send over this grey ensemble. It's great to see independent affordable alternatives to the big chain stores, with their own styling and production. My favorite thing about these pieces are the pockets that stick out and create angled layers. Thank you Annie! THAT SKIRT IS GREAT !!! REALLY GREAT !! Very cool. It's like an elegant and refined version of those jean cut-offs with the pockets sticking out (of which I am not a fan, by the way), but this version is absolutely beautifully done. Prachtig! En super ook met die schoenen. The Scarletroom is definitely one of my favourite online store! They always have such wonderful minimalist pieces. At a great price too! I remember wearing this back in 2004., all of my cut offs had pockets that stand out! Wauw, staat je zo mooi Ivania!! I have to have it. My god, those shorts are amazing! yes, I really like this!!! I love the difference in edges, round versus rectangular. Plus, I still can't get enough of matching separates. As contradicting as it sounds, I really like the relaxed structure of those shorts. 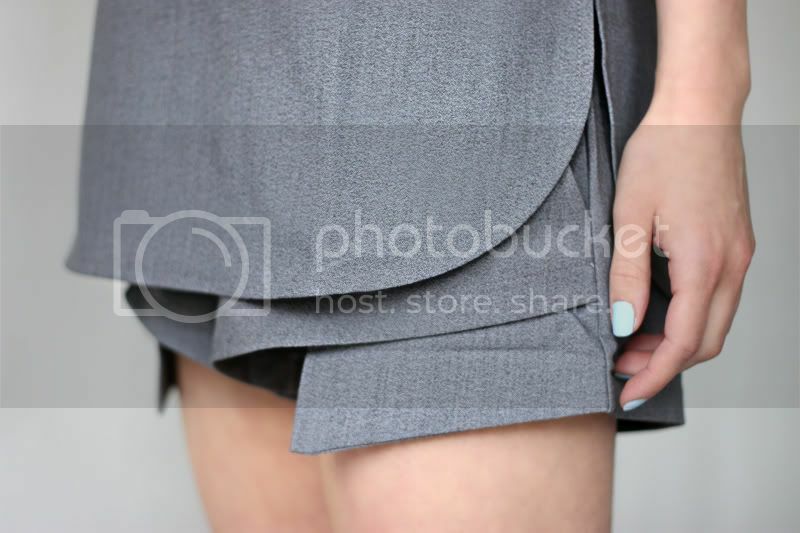 Definitely a more refined way of exposing beneath the natural hemline. this looks so amazing on you. The origami effect that the pockets make are so mesmerizing! I love the shoes with this outfit! Great outfit - wonderful shoes! Perfect wardrobe addition! It's a simple grey piece spun differently (sticking out pockets) for an interesting silhouette. Love it. Love that it's very minimal but still special. Those heels are also really great. oh wow I love the detail of the layered pocket. It's beautiful how this outfit has its simplicity and yet really it's actually quite complex in construction. Gonna go check out the rest of her stuff now!. omg, the first detail shot is so amazing! ivania this is seriously freakin' fab!! and your nail color actually really goes well with that formal grey too. your posts are always a eye candy :)! The fabric is so crisp! Stunning! these pockets are way too cool! nice geometric cuts. i´ve looking for some similar stuff for my holidays. Ooh this is great. Such a sophisticated take on the more common version with denim cutoffs. Love it! A perfect detail makes the most of simple outfits! so perfect, especially with those heels! this outfit is amazing! really cool shapes! Those are the perfect everyday heels! I'm quite tall (for a girl) at 5'9 so I normally hate wearing heels but these are great! Just discovered your blog. Your inclination towards chic minimalism is right up my alley! I'll be sure to have a blast back-tracking all of your entries. those shorts are phenomenal. i want a pair NOW! The pockets sticking out is probably one of the best innovative fashion ideas I've ever ran into! I love her hairstyle, too! I'm not surprised why her online shop is one of the bests around... What's their latest addition? And what exactly is their online shop's site again? Very cool. Het is als een elegante en verfijnde versie van deze jean cut-offs met de zakken te steken (waar ik ben geen fan, door de manier), maar deze versie is absoluut prachtig gedaan.